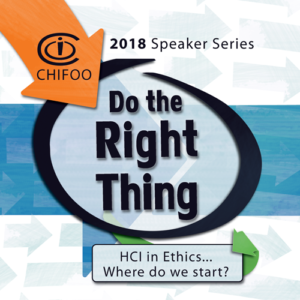 HCI in Ethics…Where do we start? Designers must consider if the desired outcome is in the user’s best interest, which then makes it a moral and ethical issue. Best choices are not always clear cut and they are not the same for everybody. How can we help people do the right thing? How do we know what that is for the individual? Added to this dilemma is change, the only constant. In the world of user experience design, new devices require new interactions. How do we, as practitioners, continue to expand our perspectives while existing platforms evolve and new platforms emerge? In 2018, CHIFOO is celebrating its 25th year. We will take up the discussion of ethics in design, user experience, augmented reality, virtual reality, and artificial intelligence as a framework to examine how our industry has changed, how to be more effective in the present, and how to plan for the future. There are no bones about it this is going to be an excellent year for speakers, but sometimes it will be difficult to come to every meeting. Solve the problem by choosing a design category for the year to help you choose (if you must- we will miss you). There are three categories of focus in this year’s speaker series: HCI Ethics in Technology (Blue), HCI Ethics in Society (Orange), and HCI Ethics in Research (Green). Each category has been assigned a color so that it can be followed throughout the year more easily.